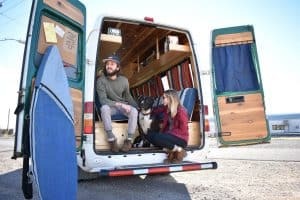 Where do we house all of the electrical components in our van build? 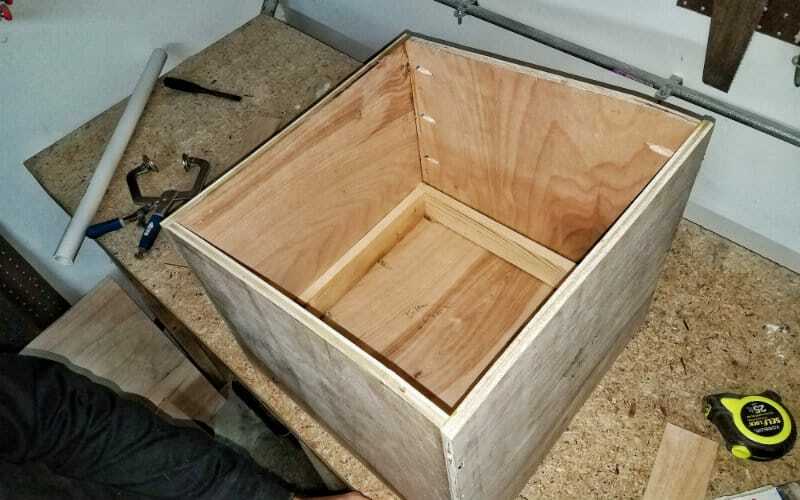 We have two big AGM (absorbed glass mat) batteries in our van, and we decided to build our own battery box out of plywood. 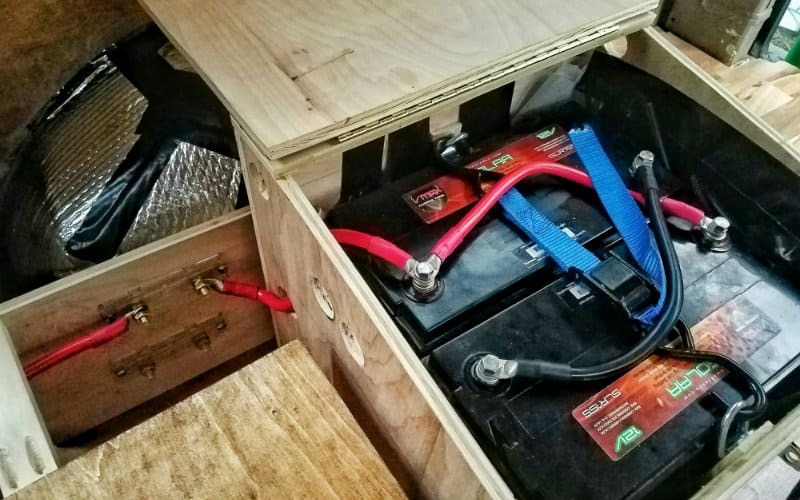 Some may argue that a battery box is unnecessary for AGM batteries, but we just felt safer having one. And because our batteries are a weird size, we couldn’t find any commercially available battery boxes that would fit them. 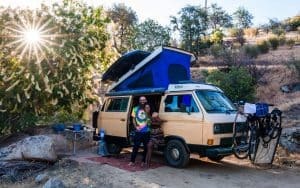 So, we built our own. Here’s how. 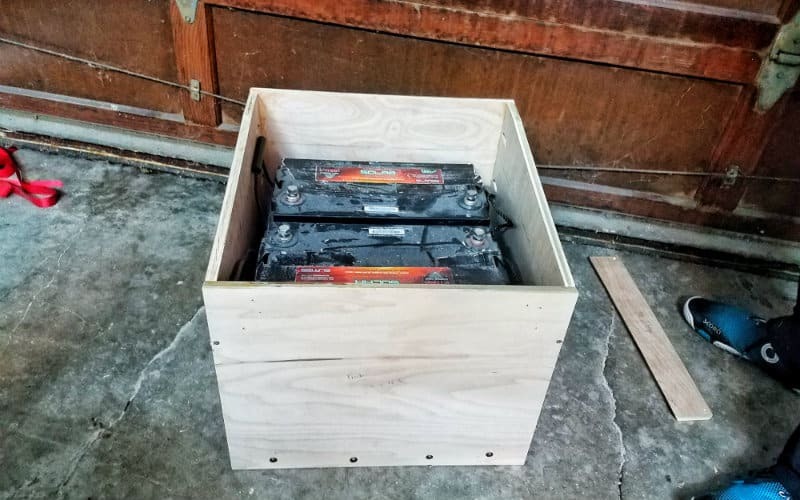 We built our battery box to house our two VMAX 155ah deep cycle batteries. These batteries are about 13-½” long, 6-¾” wide, and 11-½” tall. We decided to have them sit side by side, so the inside of our battery box had to be about a 14” x 14” square. We also wanted plenty of room above the battery terminals. 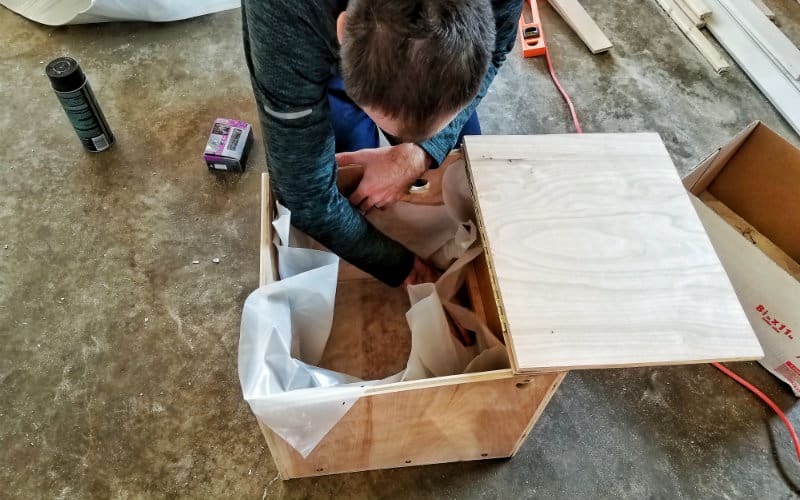 It will make it somewhat easier to open the lid and access the batteries once the battery box is mounted underneath our pullout queen-sized bed frame. 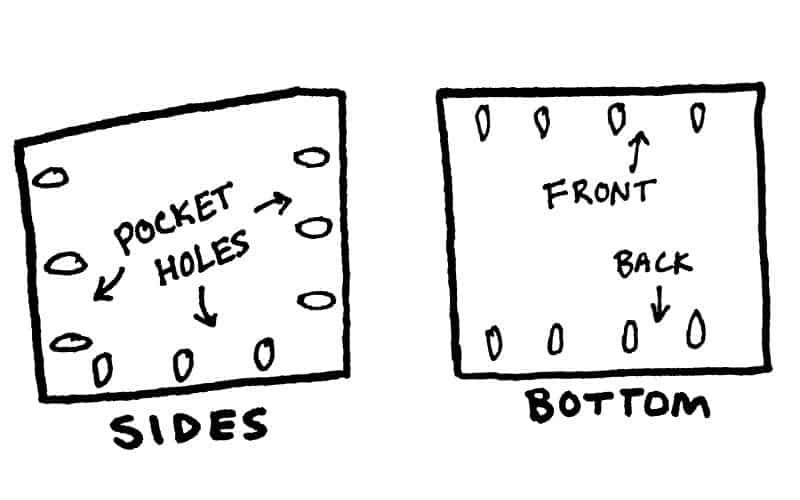 If our batteries did release hydrogen gas, the raised area gives it somewhere to rise and vent out through the vent holes that we drilled. We also lined the inside of the battery box with plastic to help contain battery acid in the (extremely unlikely) event of a spill. First, we cut out all the plywood pieces with our trusty jigsaw. For the angled pieces, we drew the measurements on the plywood first using a carpenter’s square. We attached all the sides of the box together using pocket holes. 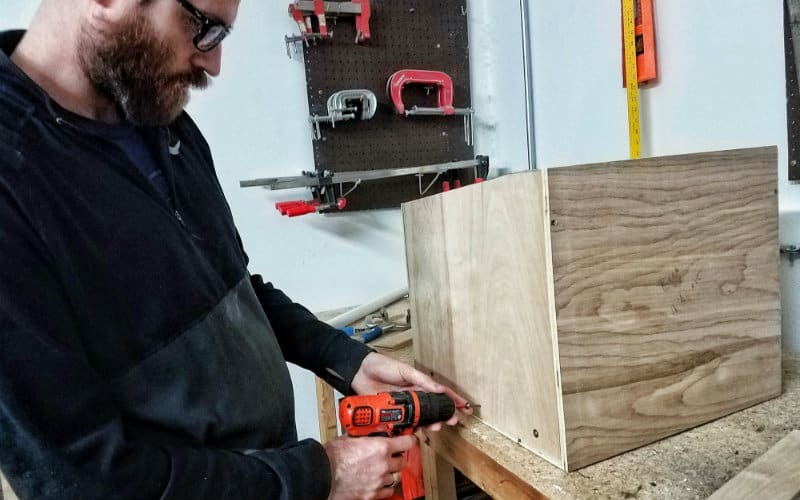 If you’re not familiar with pocket hole joinery, it’s a game-changer when it comes to building things out of wood. 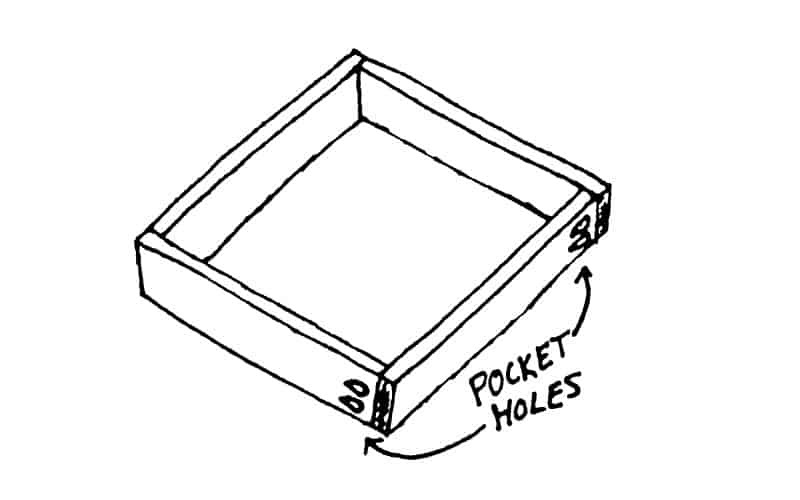 Check out our guide to using pocket holes in a van build. The angled side pieces got pocket holes on three sides – every side but the top. The bottom piece got pocket holes on the sides facing the front and back of the box. 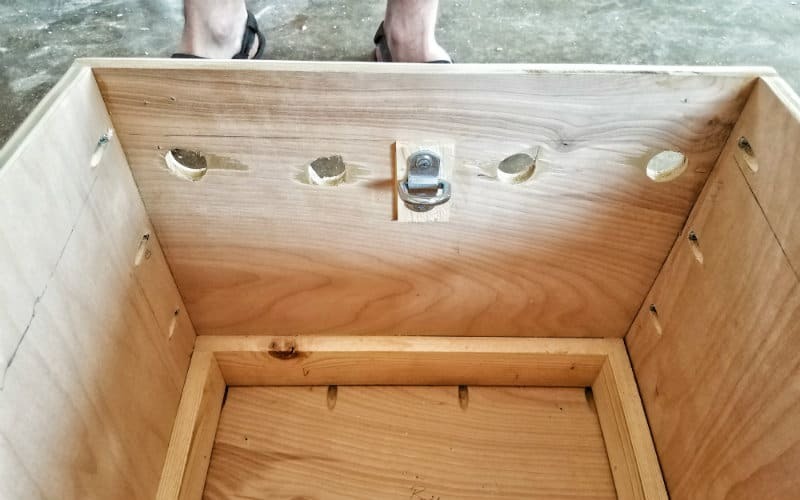 After drilling the pocket holes, we screwed the box together using 1” pocket hole screws. Our Kreg right-angle clamp really helped keep everything lined up and in place while we drove in the screws. Since we designed our battery box with some wiggle room to allow for airflow, we needed a way to keep the batteries in place inside the box. So, we made a spacer out of 1×3 furring strips arranged into a square and attached together using pocket holes and 1-¼” pocket hole screws. The spacer fits perfectly in the bottom of our battery box. Once the spacer was set in place inside the battery box, we permanently attached it using 1” GRK cabinet screws driven in from the outside. Dry-fitting the batteries proves that we didn’t screw up any of our measurements! 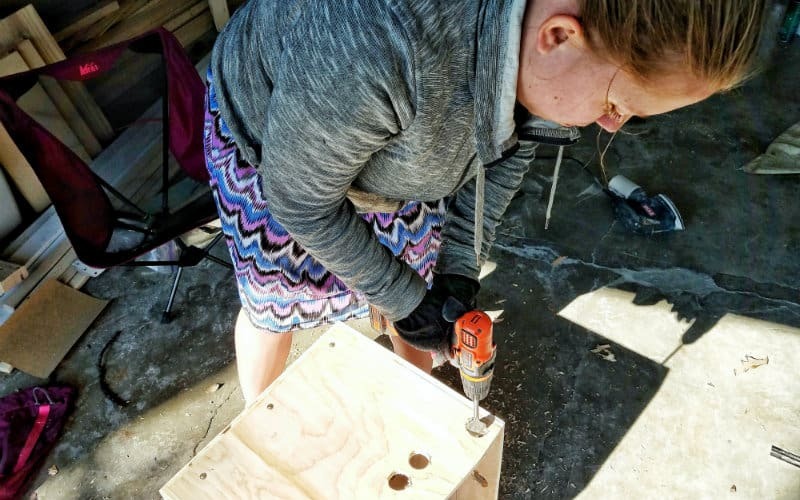 For ventilation, we drilled several holes in the front, sides, and back of the battery box using a 1-½” spade drill bit (a hole saw would work too). The front of the battery box got four holes a few inches down to allow for fresh air to flow in. We drilled holes right at the top of the angled side pieces and three more holes along the top of the back piece to let any released hydrogen rise up and escape (this is very unlikely with AGM batteries). We also drilled holes about halfway down on the left side (the side closest to the rest of the electrical components) to run our wiring through. Two D-ring anchor points inside the battery box (one on the front and one on the back) let us strap our batteries down. 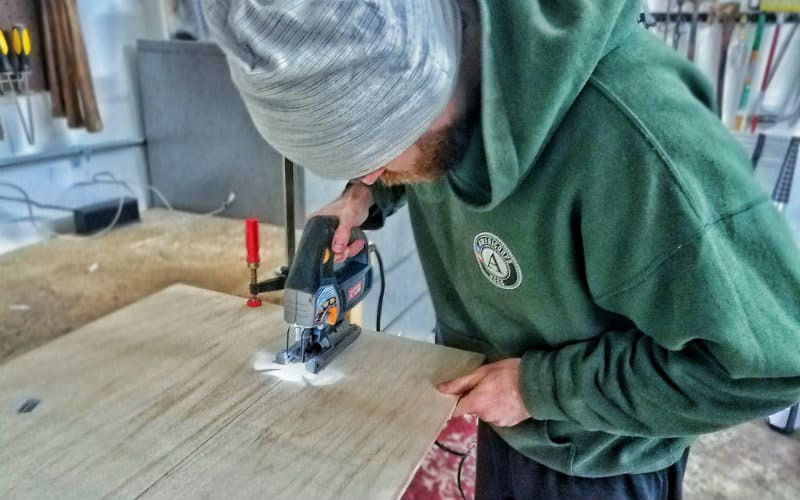 To install them, we used a piece of ¼” plywood as a spacer, Titebond II wood glue, and ¾” self-tapping screws. We layered the inside of the battery box with plastic – just in case something goes catastrophically wrong and we have an acid leak (again, very unlikely with AGM batteries). 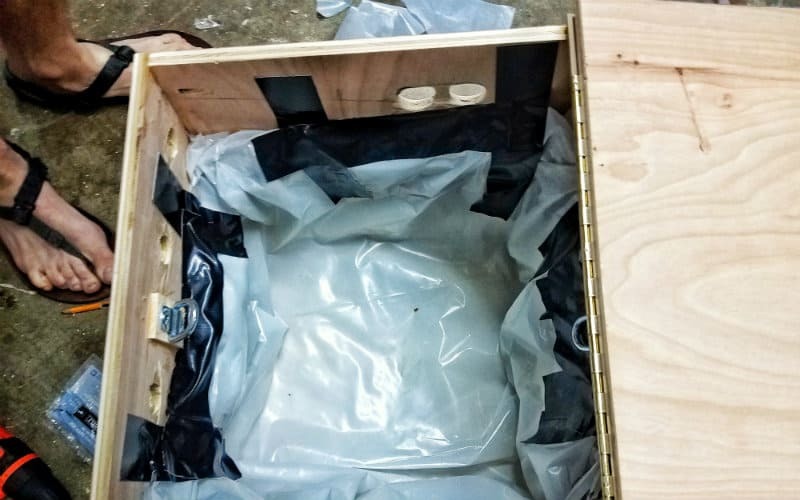 Battery acid will eat right through wood, but plastic will contain it. We bought a roll of 6-mil plastic sheeting and glued in four layers (extending about halfway up the inside of the battery box) using 3M High Strength 90 spray adhesive. We also used Gorilla tape to stop the top from folding in. 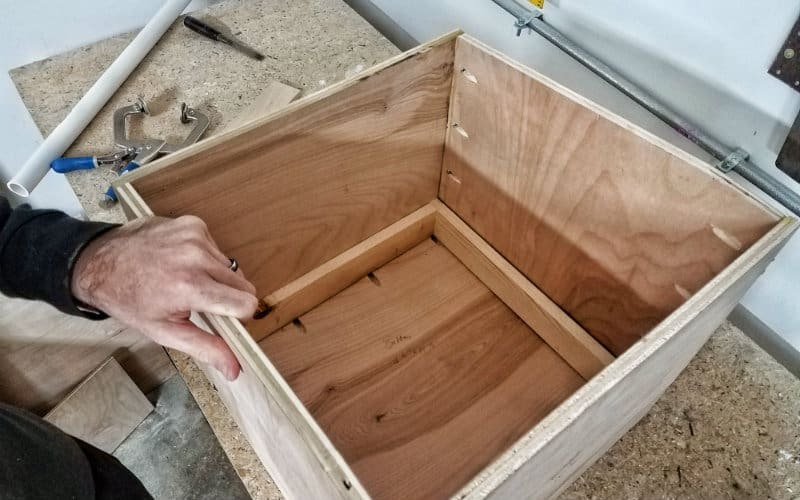 If you want something that looks cleaner and you’re willing to get your hands dirtier, you can also use epoxy and fiberglass to layer the inside of a wooden battery box. We thought lining it with plastic was easier. 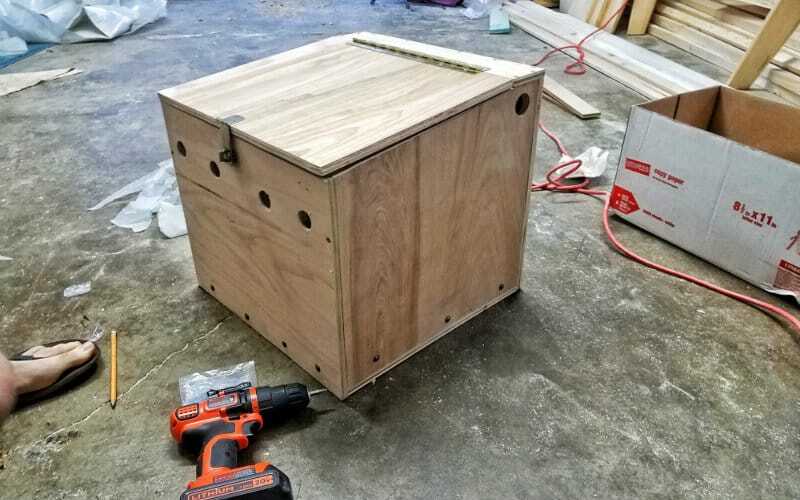 First, we screwed and glued a nailer strip to the flat section at the top of the battery box using 1-¼” GRK trim head screws and Titebond II wood glue. Then, we set the lid in place and installed the piano hinge and safety hasp latch. It’s always important to take the time to reflect on your progress. 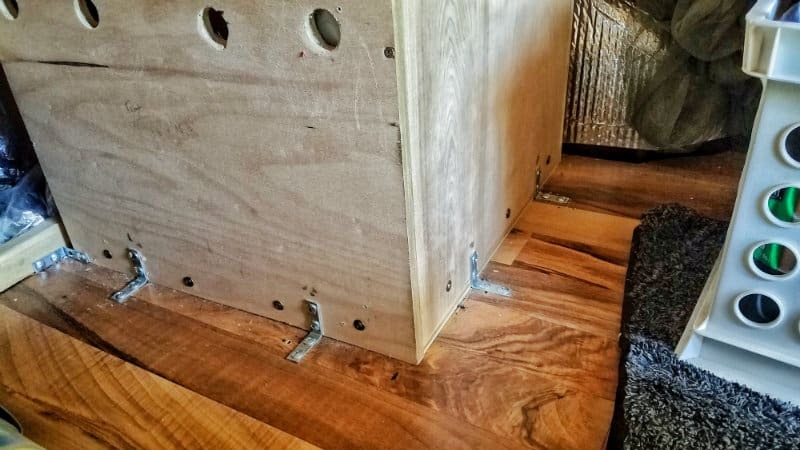 Once we had the battery box positioned where we wanted it, we screwed it directly to the laminate flooring and bed frame using a whole bunch of 1-½” angle brackets and ¾” self-tapping screws. This thing’s not going anywhere! Finally, we dropped in the batteries and strapped them down. Next comes the fun part – hooking up our electrical system! 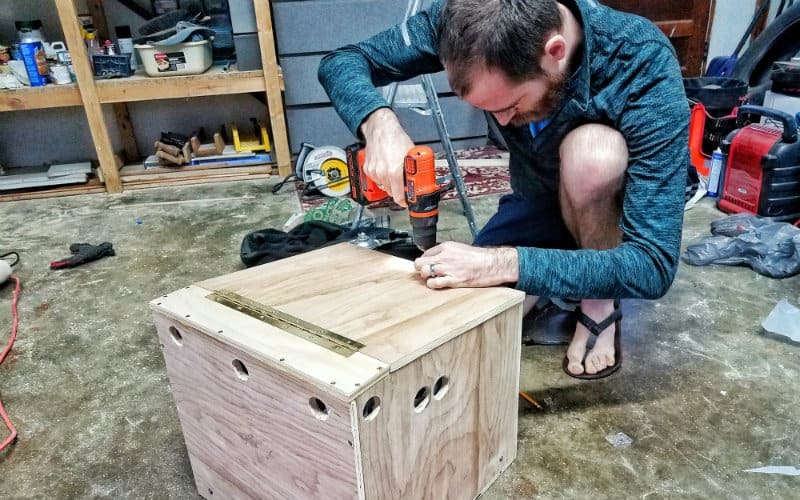 And that’s how you build a quick and simple plywood battery box. This box does the job we need it to do, it’s custom-sized to our van and batteries, and it’s a hell of a lot more sturdy than many commercially available plastic battery boxes. 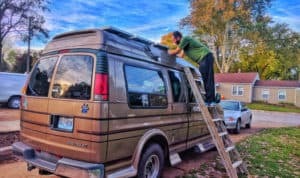 While a battery box may not be essential with sealed batteries, we still think it’s a great addition to our van. 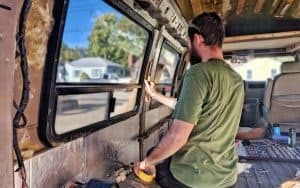 Don’t forget to follow us on Instagram @gnomad_home and on Facebook for more van build tutorials, van life tips, travel updates, and musings. Cheers! 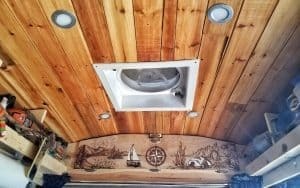 Can you describe exactly where this is sitting in your van? 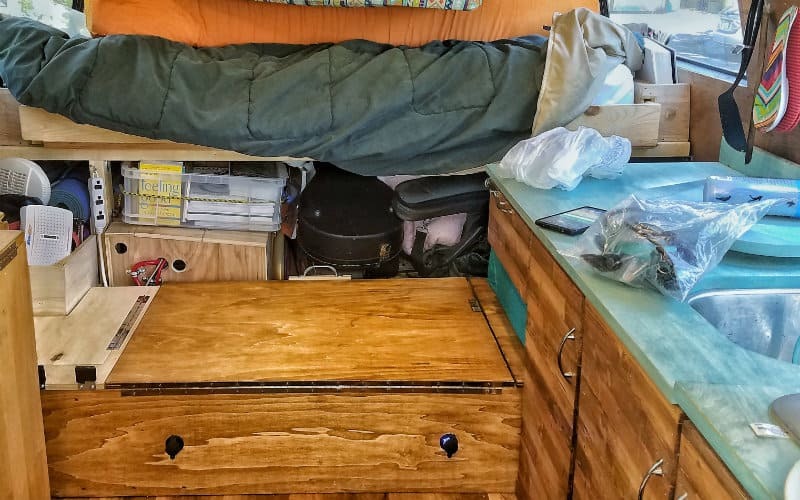 Is is directly behind the bench seat to the right and under the permanent portion of the bed? Or is it to the right of the bench seat? Thanks in advance! The battery box sits under the bed frame just behind the bench seat. You can see it in this photo (towards the left). 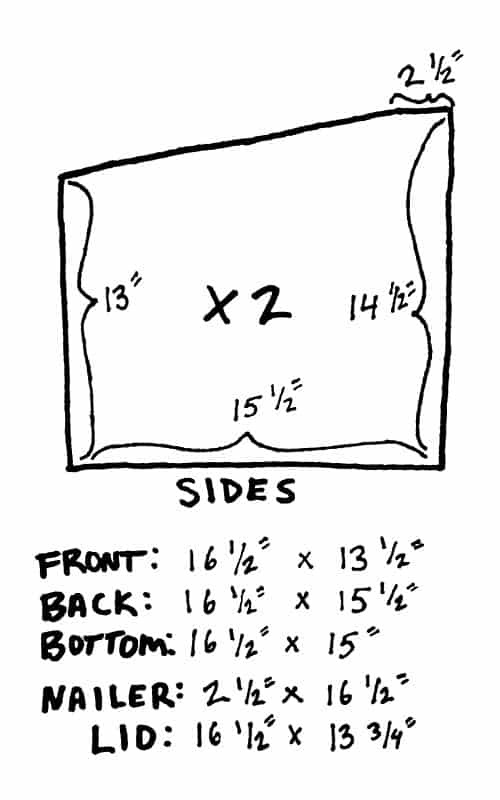 Either the sides should have a base of 15″ or the bottom should be 16.5″x15.” – the sides and bottom don’t fit together as depicted with this blueprint. 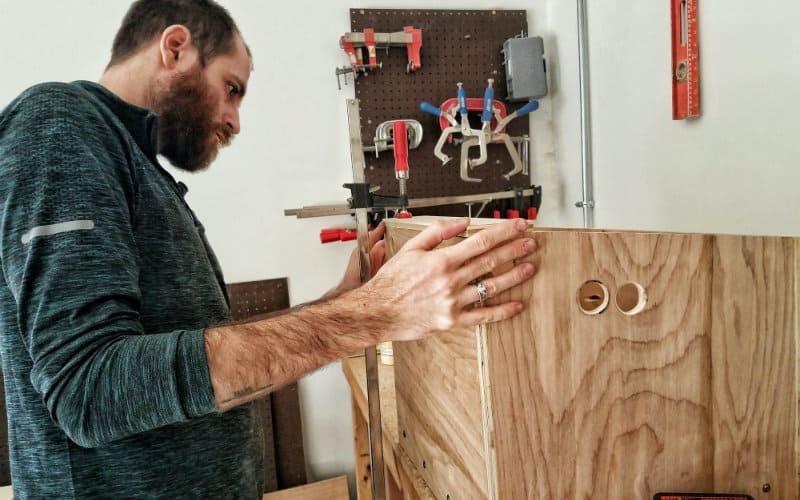 The blueprint does call for the bottom piece to be 16.5″ x 15″. The measurements listed in the post are the exact measurements we used to construct our battery box. Good luck! Hey, just wanted to say that your craftsmanship is impressive! But, those batteries are not going to be safe in a crash. You should anchor them directly to the body if you can. Otherwise you might find 100+ lbs of lead flying at you. Stay safe. Hi Brian, I 100% agree that things as heavy as a battery should be anchored to the body. 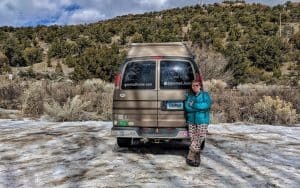 Truth be told, there could be a lot of things flying around in our van in the case of a very serious crash. 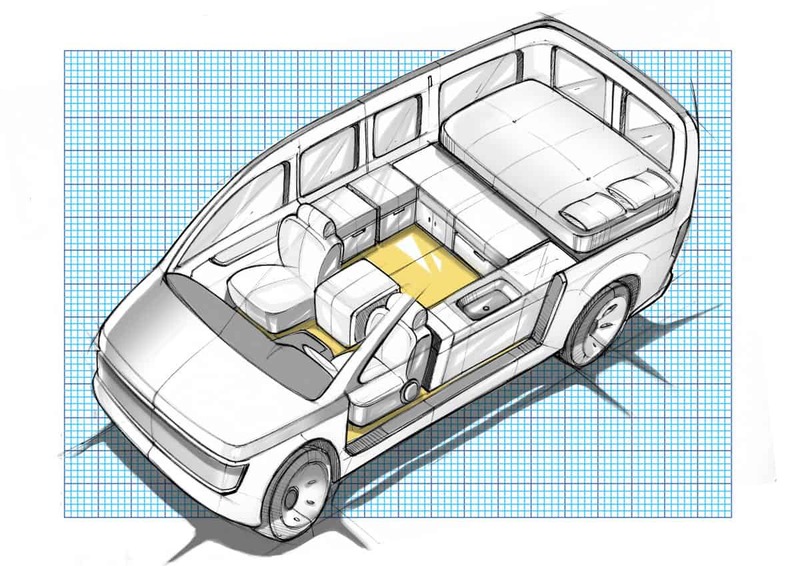 Our batteries are mounted under our bed and there’s a lot of other furniture in between us and them, but I agree that they could/should be anchored to the body for maximum safety.